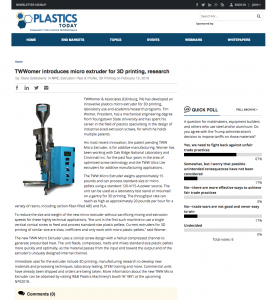 TWWomer & Associates has developed and introduced in the market their new plastics micro extruder to be used for 3D printing, laboratory use and academic/research programs. Tim Womer, president, made the announcement. Named the TWW Micro™ Extruder, the new patent pending machine is the most recent innovation by Womer for “additive manufacturing.” Womer has been working with Oak Ridge National Laboratory and Cincinnati, Inc. for the past four years in the area of furnishing optimized screw technology and their TWW Ultra™ Lite extruders for additive manufacturing applications. “Additive manufacturing” is the industry term (ASTM F2792) used to describe the process of joining materials to more quickly manufacture objects from 3D modelling data, usually layering technology. This is the opposite of traditional subtractive manufacturing techniques where material is removed from a stock base object to make the desired configuration. The TWW Micro™ Extruder weighs approximately 15 pounds and can process standard size or micro pellets, using a standard 120v/15a power source. The unit can be used as a laboratory test stand or mounted on a 3D gantry for 3D printing. The throughput rate can reach as high as approximately 20 pounds per hour for a wide variety of resins, including carbon-fiber filled ABS and PLA. 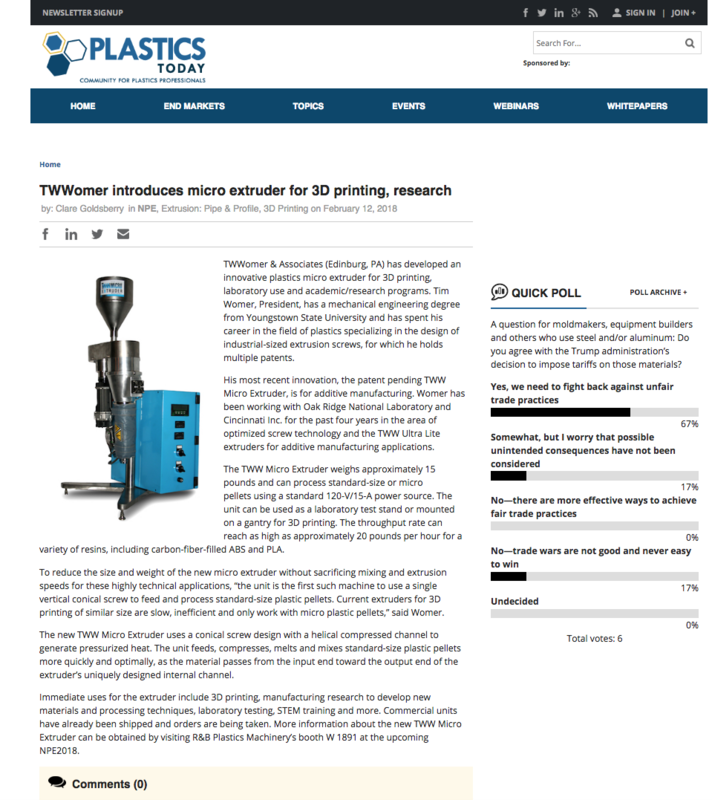 To reduce size and weight of the new TWW Micro™ Extruder, without sacrificing mixing and extrusion speed for these highly technical applications, the new TWW Micro™ Extruder unit is the first such machine to use a single vertical conical screw to feed and process standard size plastics pellets. 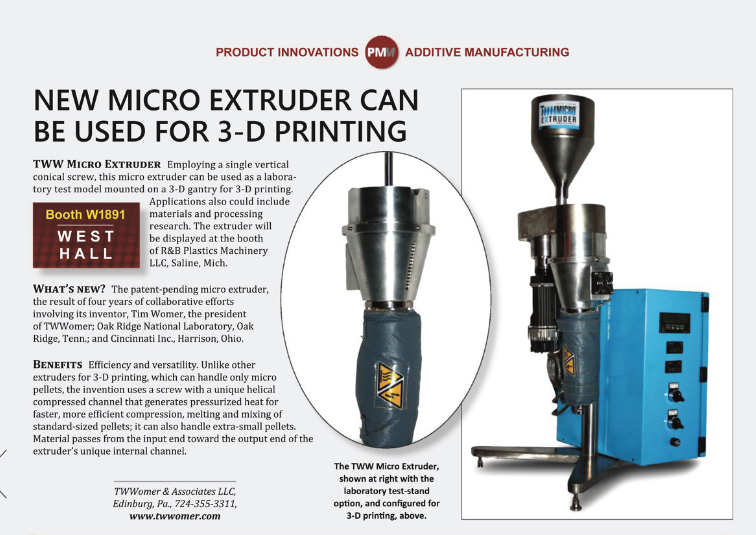 Current extruders for 3D printing of similar size are slow, inefficient and only work with micro plastics pellets. The new TWW Micro™ Extruder uses a conical screw design with a unique helical compressed channel to generate pressurized heat. 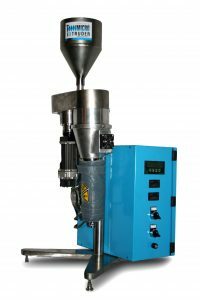 The unit feeds, compresses, melts and mixes standard size plastics pellets more quickly and optimally, as the material passes from the input end toward the output end of the extruder’s uniquely designed internal channel. 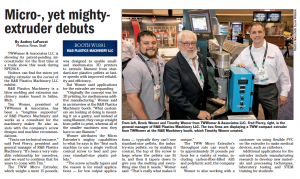 Immediate uses for the new extruder include 3D printing, manufacturing research to develop new materials and processing techniques, laboratory testing, STEM training, etc. Commercial units have already shipped and orders are being taken.